Lazy Saturday Brunch at Brockley Market – Why Waste Annual Leave? When Mademoiselle became Madame, she made her debut in South London, I must admit I was a bit apprehensive. In my tenure in London, I had grown to love the leafy green pastures of West London, of Hyde Park, the waterside pubs in Wandsworth. I loved the gelaterias and independent boutiques that line the streets of Hampstead in North London. I loved the vibrant multi-cultural smells and flavours of East London’s rich cultural tapestry but what would South London hold for me? I was a complete stranger here. So I’m still in that experimental phase of my life down here, the small things excite me and I’m discovering new facets all the time. And so, I recently stumbled upon Brockley market in an affluent part of Lewisham, a stone’s throw away from St John’s station. A baby in the food market world, it has recently celebrated its 2nd birthday and this affords it the trump card of being much quieter than its neighbours, Borough Market and Greenwich Market. I am an enthused frequenter of all such markets but this was the only one that I was able to walk around in freely, taking it in at my own pace without standing in a 20 minute long queue for a lump of cheese. Although fresh produce is plentiful with all the usual suspects – deli meats, cheeses, breads, fruit, preserves and even an entire stall dedicated to butternut squash – the real selling point here is the selection of hot street food available. There are also plenty of short wooden stools floating around the market with spaces to sit and enjoy your food. Only open on Saturdays between 10am – 2pm, bring cash (neighbouring ATMS are few and far between) and arrive hungry – I indulged in a 3 course meal during my short hour here and still came home with bags full of goodies. My smoked salmon and cream cheese blini was light and refreshing and a great amuse bouche to get the juices flowing before I embarked upon the fish dog – a freshly battered piece of high quality white fish, served in a hot dog roll with home made tartare sauce and mushy peas. I overheard the stall owner saying that the majority of their customers are children but I was not ashamed to stand proud with mine in hand. As if the concept of fish and chips needs any improvement, Fish Dog excels at taking it one step further. Pumpkin often tends to get the red meat options when we are out (I wonder if this is because I don’t cook it much at home) and opted for the freshly made schnitzel burger, battered and fried in front of you and worlds apart from the dry, stodgy, reheated schnitzel sandwiches I’ve tried in the past. 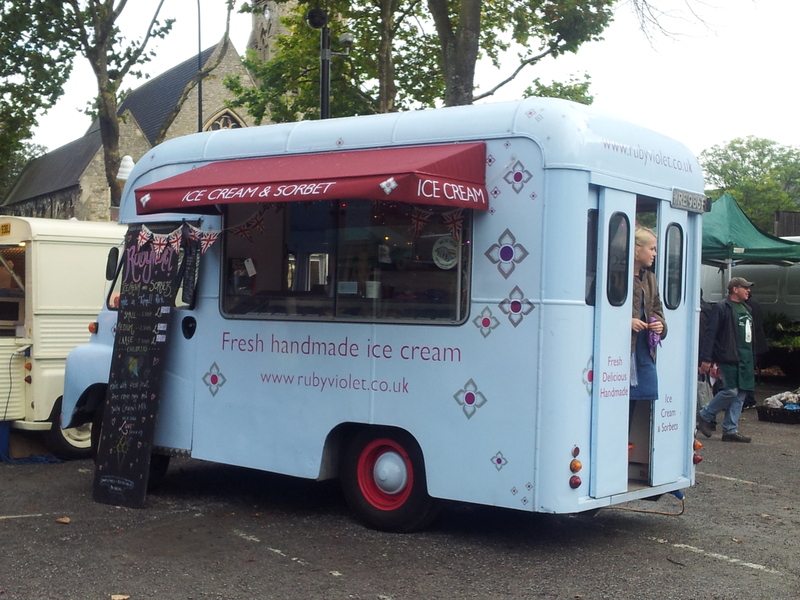 For me though, Ruby Violet’s ice cream van with her salted caramel and apricot rice pudding flavours took the biscuit. Stuffed to the brim, I sampled both to try and make the choice. What’s the point? We all know I was always going to have both. Cakes, bakes and a creative assortment of whoopee pies are up for grabs and my takeaway bag ends up weighing more than I do – I’ll be returning for the peanut butter brownie and the freshly made gyozas, which Time Out has apparently rated as amongst the best Gyoza in London. It seems there is a poll for just about everything in London. 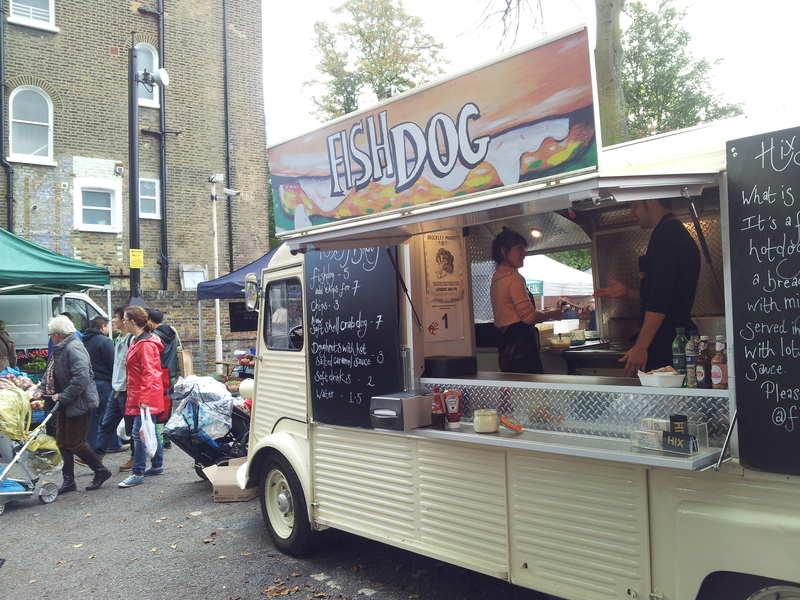 One to add to the list – hadn’t realised that FishDog went out to this market! 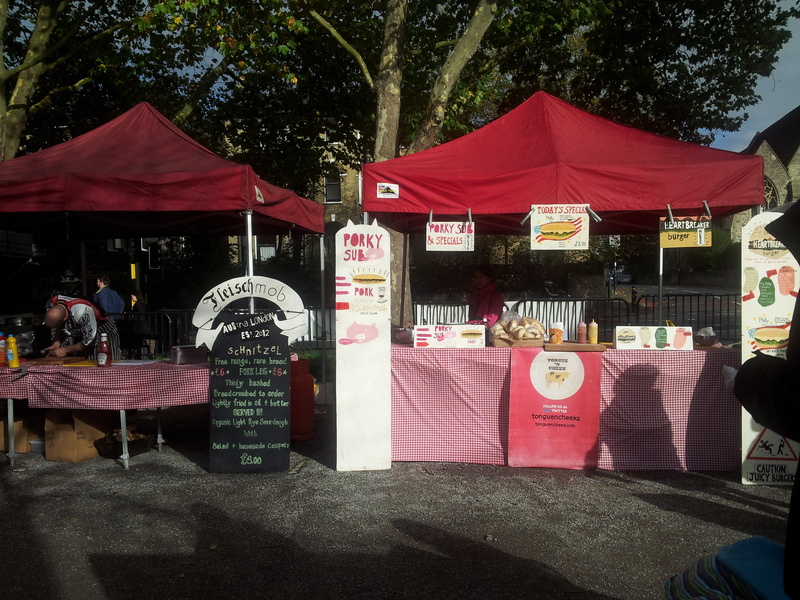 yep,i first saw them at street feast but not till i’d already stuffed myself so went chasing after them at brockley! Thanks for commenting on my blog and leading me here! I haven’t yet visited Brockley Market, but your post has convinced me that it’s the next one on my list. The ice cream from Ruby Violet looks especially divine! No – thank YOU for introducing me to Broadway!! Yes ruby violet ice cream is fabulous – she also has a parlour in tuffnell park so I’m planning to venture there one day to see the full choice of yummy flavours! Pingback: The Lewisham Micro Library – Hot off the Press…The Littlest Library I know… | Why Waste Annual Leave? Pingback: The Greenwich and Docklands International Festival, London | Why Waste Annual Leave? Pingback: The Big Red Pizza Bus – Double-Decker Dining in London | Why Waste Annual Leave? Pingback: Alternative Sights and Experiences in Florence | Why Waste Annual Leave?